Every year millions of Americans enjoy celebrating America’s birthday with family and friends. Back yard barbeques, pool parties, and boat rides are a few of the activities we enjoy during the day. When the sun goes down, booms, crackles, and pops fill the warm summer air and magnificent firework displays can be seen for miles. While this is a great time of year, the July 4th holiday is considered the most dangerous holiday of the year. According to the National Fire Protection Association (NFPA), fire departments are inundated with phone calls. 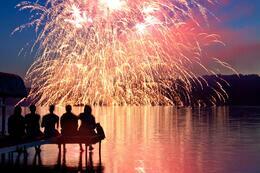 Each year on average, fireworks cause 1,300 structure fires, 300 car fires 16,900 outdoor fires. Here are some things that make the holiday dangerous for us, along with safety tips to ensure a fun and safe holiday for you and your family. Fireworks. They should be handled with caution and respect. Displays shooting into the night sky can get out of control very quickly. The most common injuries are burns. Sparklers, which are often a family favorite, burn at nearly 2,000 degrees. If your child drops one on the ground, tell them to back away and spray it immediately with water. Drunk driving. Consider alternating between alcoholic drinks and water to stay hydrated and reduce the risk of impairment. If you’re impaired, call a family member, friend, or a taxi for a ride. Don’t put yourself or others at risk. Accidental drowning. According to reports from the USA Swimming Foundation, 163 children drowned in 2017 between Memorial Day and Labor Day. If you plan to spend time with your kids near a pool, spa, or lake, keep a watchful eye. If they’re not strong swimmers, make sure they wear a life vest. Never rely on water wings or noodles to keep them afloat. An accidental drowning can occur in seconds. Boating accidents. If you own a cottage on a small lake, you’re probably very aware that boat traffic increases significantly on a warm weekend or holiday. Inexperienced boaters, along with increased congestion, can lead to injuries. In addition, never drink alcohol while driving a boat. Just as on the road, the consequences can be deadly. For additional safety tips, visit the blogs below. Do you have any tips or related information you’d like to share? I’d love to hear from you; please share them in the box below. If you’re a content writer and would like to contribute to our blog, click here to read our guidelines.